Zuni Pueblo. English Pronunciation: "Zoo-nee" Traditional Name: SHE-WE-NA A Zuni Legend tells the story of the parrot and the crow, each of whom presents and egg to the Zuni women to decide which one they will keep. 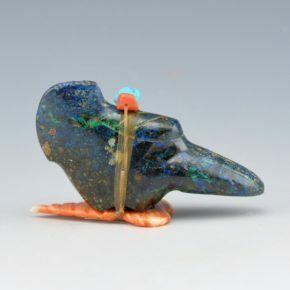 The women choose the egg of the crow because of its wonderful turquoise color. The Zuni love of color is reflected everywhere in the3ir daily lives, as well as in their ceremonies. 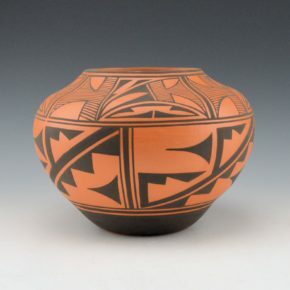 While comparatively little pottery is made by Zuni craftsmen, they have a tradition of beautiful work in clay and still use their work in ceremonies. The murals of Alex Seowtewa in the Mission Church of Nuestra Senora de Guadalupe in the plaza of the Pueblo are remarkable examples of Indian painting at its best. They depict the history and the culture of the Zuni people and demonstrate once more the Zuni genius in the use of color. The church itself is a good example of traditional Pueblo architecture. One of the most famous of the Kachina dances, Shalako, is held every December in the Zuni Pueblo, to celebrate the end of the old and the beginning of the New Year, and to bless all of the houses of the Pueblo erected during the year. 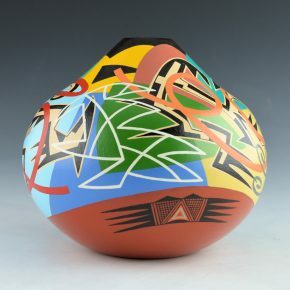 This large jar by Les Namingha is inspired by Hopi-Tewa shapes and designs. The band around the shoulder is a series of very classic Hopi-Tewa designs. They are painted in traditional colorations. However, it is the top and bottom of the jar which become the overall focus. 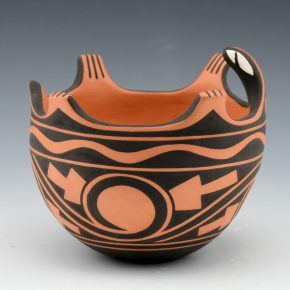 The top has multi-color ellipses which extend downward from the rim and over the Hopi designs. They give the jar a dynamic appearance. When looking down from the top, the color and shape variations almost have a kinetic feel! Les said he wanted it to look like a “pinwheel” with spinning colors. The bottom of the jar has more solid geometric shapes and the multi-color forms are more angular. 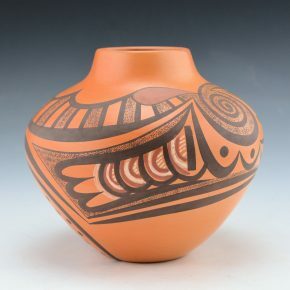 The jar itself is a classic Hopi shape with the wide shoulder and short neck. It is a complex and striking jar. It is signed on the bottom in the clay. 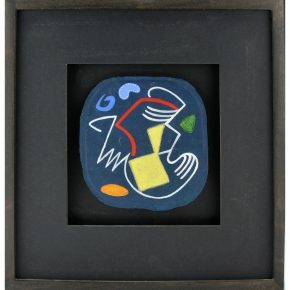 This framed tile by Les Namingha is from 2004. It is painted with acrylic on the clay surface. The design is a variation of geometric shapes and a connecting white line. Much like he has used the white line in his other pottery, this one follows a “migration” pattern across the surface. It is a fascinating piece and great to see how his work has evolved over time. It is signed on the edge of the tile. It is in excellent condition with no chips, cracks, restoration or repair. 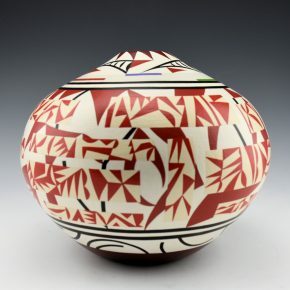 This jar by Les Namingha uses traditional Hopi clay, is painted with bee-weed and natural clay slips, and it was traditionally fired. The jar is from the late 1990’s. 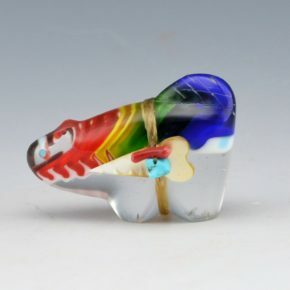 The piece is fully polished and it has a free flowing cloud, rain and sun design. It is interesting to see how early on Les had evolved from traditional Hopi-Tewa designs to more create and innovative imagery. 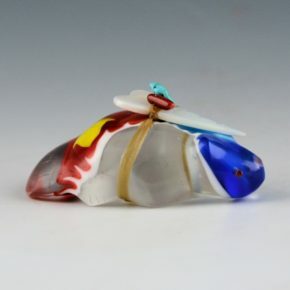 Today, his work utilizes acrylic as opposed to the traditional clay slips. The various colors on the surface are the blushes from the firing. It is signed, “Les Namingha” and it is in excellent condition with no chips, cracks, restoration or repair. 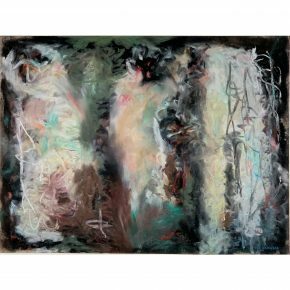 This painting by Les Namingha is entitled, “Polychrome II (Dextra Series)”. It is one of a series of acrylic paintings on canvas he made which explore both his pottery and that of his aunt, Dextra Quotskuyva. This piece was made in 2010. The central panel has a classic Hopi-Tewa design with two hummingbirds. Note the intricacy of the two birds and the surrounding designs. The various colors depict both his work and Dextra’s. The painting is signed on the front and on the back. It is in excellent condition. 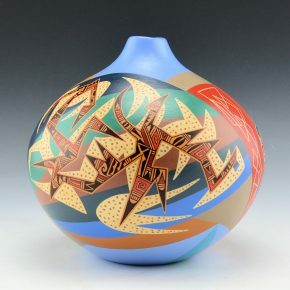 This jar by Les Namingha is inspired by Hopi-Tewa and Pueblo bird wing designs. Let’s start at the first photo and the bottom of the jar. 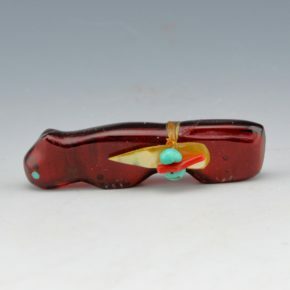 The is a classic Hopi-Tewa bird wing design painted in black on the red. Looking up at the rest of the jar, in black (with tan highlights) there are a series of birds. There are Hopi, Zuni, and even a San Ildefonso style bird. The spiraling lines painted on top of the bird wings are more free form geometrics. 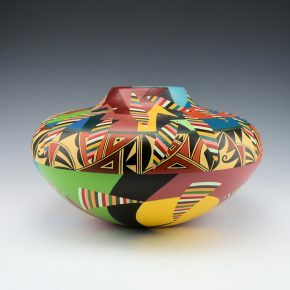 The jar utilizes a variety of colorations from the black, red, and brown of the pottery to primary colors. It is a complex jar. It is signed on the bottom in the clay. Around the base are vertical lines of color representing the grass, soil and earth with the birds and hummingbirds above. The jar is signed on the bottom. This is an intricate jar by Les Namingha. He is one of those potters who continues to defy expectations in his innovative clay art. 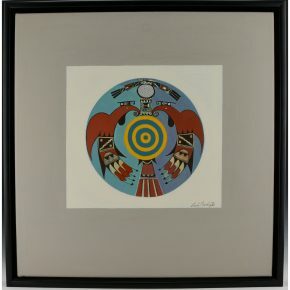 He pulls from his artistic background as well as his Zuni and Hopi heritage. His most recent work has pulled from Hopi imagery yet combined it in a manner which is modern in appearance. On the surface the jar, there are four seasons and he has portrayed them in an interesting manner. 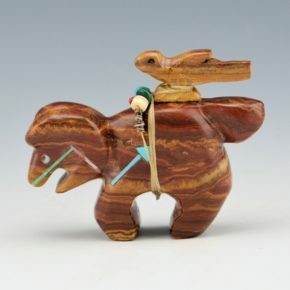 There are spring, summer, and winter with the three different Hopi birds. Each bird is painted with various Hopi-Tewa designs. One section with the dark blue at the top is the winter/Fall with the additional bird design made up of Zuni dots behind the Hopi birds. The large red area with white linear designs is the start of the new year. The coloration and designs work perfectly on this piece! It is signed on the bottom. 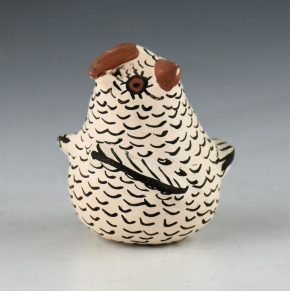 This is a charming duck clay figure from Jamie Peynetsa. He is the son of noted potters Anderson and Avelia Peynetsa. Avelia, his mother, coil builds the clay vessel. Jamie paints the design. 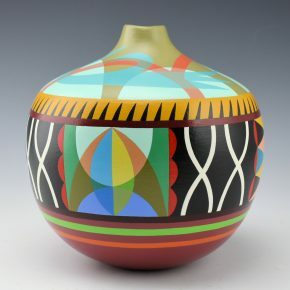 He has strong attention to the detail of the painting as well as his inspiration from classic Zuni pottery. 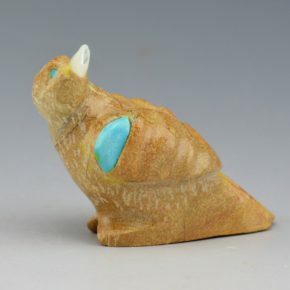 This duck is slipped with white clay and then painted with designs. The wings are and eyes are intricately painted and the dots on the front of the head are raised. The duck has a turned head and a two feathers extending up from its head. It is signed by Jamie and his mother on the bottom. 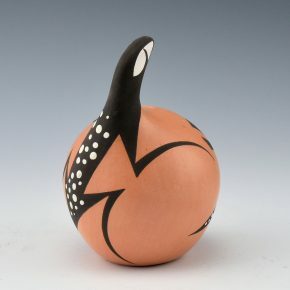 Jennie Laate was among the most important revival potters at Zuni in the 1970’s. 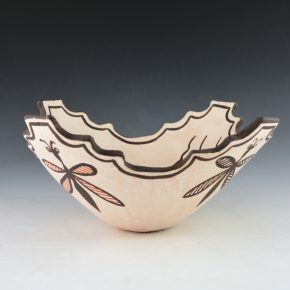 This is a very traditional style Zuni Kiva bowl. The bowl is shaped with terraced “kiva” steps or cloud shapes. In the center is a frog with a head in relief. Surrounding the frog are tadpoles. On the outside are dragonflies with the wings painted with either red or black lines. The purpose of the kiva bowls was often ceremonial and the inclusion of frogs, tadpoles, and dragonflies are representative of prayers. The kiva bowl is in very good condition with no chips, cracks, restoration or repair. It is signed on the bottom. This is one of the smallest ducks we have had from Jamie Peynetsa. He is the son of noted potters Anderson and Avelia Peynetsa. Avelia, his mother, coil builds the clay vessel. Jamie paints the design. 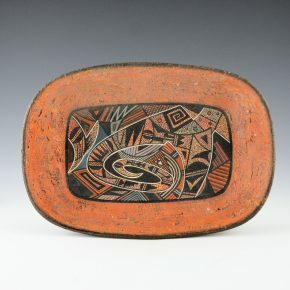 He has strong attention to the detail of the painting as well as his inspiration from classic Zuni pottery. This duck is slipped with white clay and then painted with designs. The wings are and eyes are intricately painted and the dots on the front of the head are raised. It is signed by Jamie and his mother on the bottom. This painting by Les Namingha is untitled. It is from a series he has painted using pastel on paper. The piece is a modernist approach to color. They are all colors used in his pottery and it is interesting to see how they play against one another in Les’s mind. That playfulness comes out in the lines and colors of the piece. There are hints of figures and even a dragonfly, but they ask the question of whether they are intentional or simply our minds seeing more in the pastel colors! It is framed in a wood frame with a white matte. It is signed in the lower right corner, “Les Namingha”. This is a small owl figure painted by Jamie Peynetsa and made by his mother, Avelia. 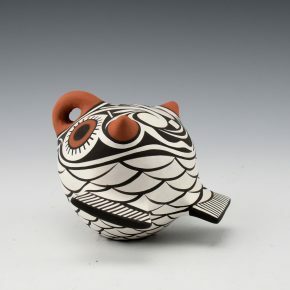 The owl is a classically shaped figure for Zuni pottery. 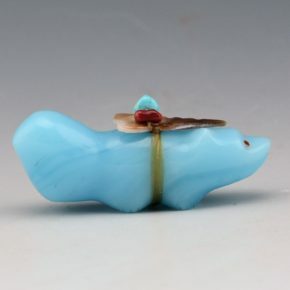 The piece is charming with a round body with extended beak, tail, and wings. The piece is fully painted with the feathers. There is a rainbird design on the back of the head. In Zuni culture, the owl is the protector of the home and the keeper of the night. He is able to see what others cannot see and is thought to be very observant and perceptive. He is thought to have true wisdom and patience. Jamie has signed the owl on the bottom. The jar has a round body and a short neck. The jar has striking colorations and there are birds painted on each side in medallions. They are additionally designed with different imagery on for the bodies. One the sides and encircling the jar are large yellow ellipses. These bold geometrics accentuate the detailed designs on the remainder of the jar. It is signed on the bottom. The last photo is one of this jar next to a piece by Elizabeth Medina. It seemed interesting to show the style of birds from Zia in comparison to this jar. 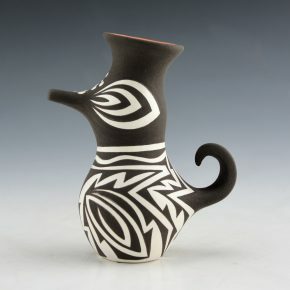 Anderson Peynetsa is known for his vessels as well as his figurative pottery. This duck figure is one of his technically amazing pieces. The figure is opened at the top and has extended pieces of clay at the head and tail. 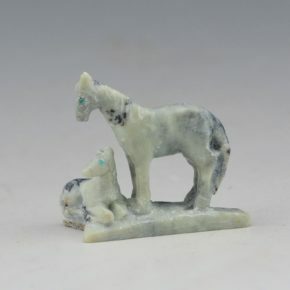 It is fully painted but it is the use of the heartline deer around the body of the piece which is so striking. They are painted in his own style with the elongated necks. 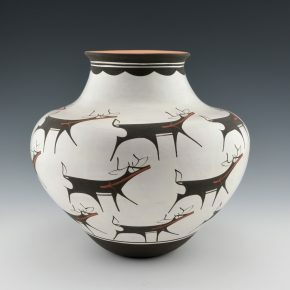 Anderson has an elegant and modern stylization of the heartline deer on his pottery. It is fascinating how a piece can appear both modern and yet reflect cultural history and charm. The area above and below the deer painted with a mottled red and black over the white. The piece is complex in both form and design. It is signed on the bottom in the clay. 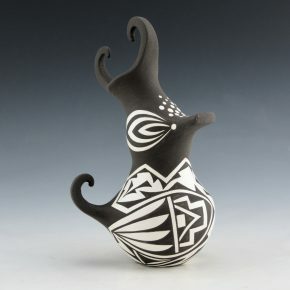 This is a striking olla by Anderson Peynetsa. The jar is a beautiful shape with a wide shoulder, a slight indention before the neck and a slightly turned out rim. The body of the jar is painted with painted with two rows of heartline deer. All together there are 12 of them on this jar! Each deer is very tightly painted and they are stylized with thin legs. Each deer is surrounded by a prayer feather and cloud pattern. The additional designs adds to the dynamic appearance of this jar. The heartline deer is a classic image in Zuni pottery, with the heart representing the strength and spirit of the animal. Anderson has signed the bowl on the bottom. Jamie Peynetsa is the son of noted potters Anderson and Avelia Peynetsa. Avelia, his mother, coil builds the clay vessel. Jamie paints the design. 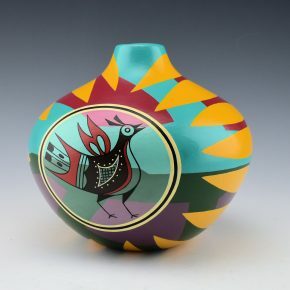 He has a strong attention to the detail of the painting as well as his inspiration from classic Zuni pottery. This jar is very tightly painted with rain designs above the shoulder. The thin lines are even and add complexity to the piece. The sides of the jar are boldly painted with lightning patterns. Note how well Jamie paints to match design and form. It is signed by Jamie and his mother on the bottom. At only 20 years old, he certainly has a great future in pottery! This is a charming bowl by Anderson Peynetsa. 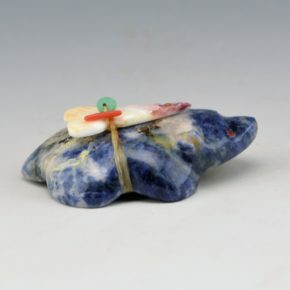 It is made using the red clay and the bowl is in the shape of a turtle on its back. The sides of the piece are fully painted and there is a swirling rainbird design. Anderson has signed the bowl on the bottom. Yes, definitely charming. 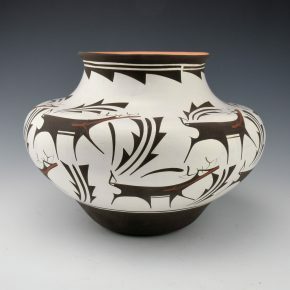 Jennie Laate was among the most important revival potters at Zuni in the 1970’s. 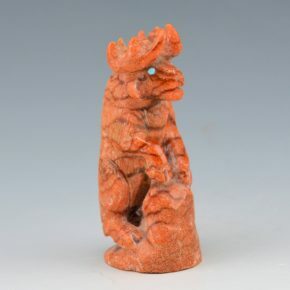 This miniature owl clay figure. 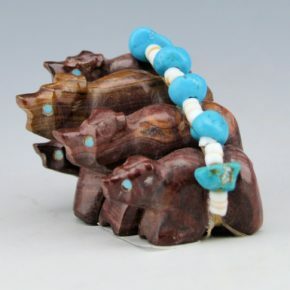 It is coil built and in the style of the classic Zuni owls. She has painted the feathers onto the surface of the piece. It signed on the bottom and it is in very good condition with no chips, cracks, restoration or repair. The last photo is of the owl next to the large jar which is online relative to scale. 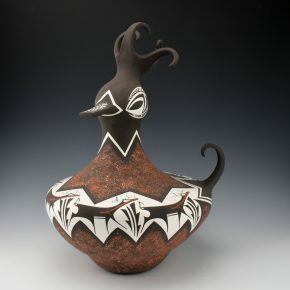 Susan Folwell (Santa Clara )and Les Namingha (Hopi-Tewa/Zuni) collaborated together for the first time on a series of vessels in a show entitled “Corn:Maiden:Cultures” in 2015. The concept for the exhibition was that the Corn Maiden in Pueblo culture can also be found as a primal female archetype in cultures throughout the world. 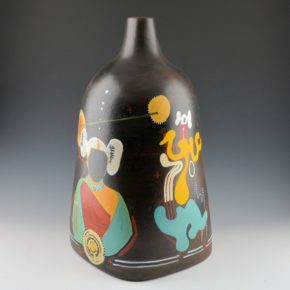 There is play back and forth on these vessels as the multi-cultural figures are placed within a Pueblo context as the “Corn Maiden”, who brings the corn, the harvest and life. This jar has been in an exhibit at the Museum of Indian Art and Culture since 2016. This large jar was made by Les. The designs painted by Susan on two sides show a Hopi maiden and a Pueblo maiden. Her idea was to leave the faces empty, so that they did not represent just one person, but all women. The two women represent the Pueblo and Hopi ancestry of Les and Susan. Playing from Susan’s more realistic portrayals, Les painted a more modern version of the women on the other two sides. The angular shape of this vessel, made from Zuni clay, is unusual but also perfect for this important imagery. In many ways, this powerful jar brings together the ideas of womanhood, femininity, modernism and the continuing importance of the Corn Maiden concept in Pueblo culture. The dark brown background works perfectly for this intense jar. 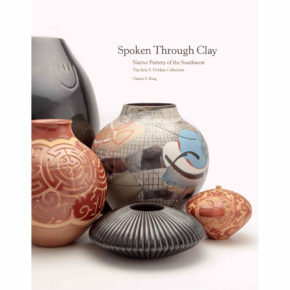 Check out more of their exceptional collaborative pottery in the book, “Spoken Through Clay”. This jar by Ian Peynetsa is from 1994. It is a more classic style of Zuni design with the Zuni rainbirds and the fine-line rain deigns. It is an interesting combination of these classic designs with the vertically polished white slip to enhance the designs. 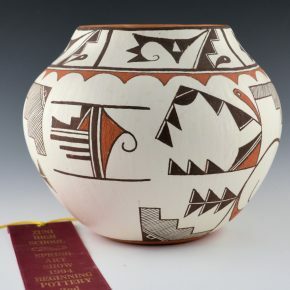 The jar won a 2nd place at the 1994 Zuni High School Art show. It is signed, “Ian Peynetsa”. While he no longer makes pottery, it is a striking example of creative student art! It is in excellent condition with no chips, cracks, restoration or repair.